Here are some official photos of last nights reveals at Hasbro’s “Twas The Night Before” event. These photos showcase the new Star Wars Black Series figures. These are due in Spring 2015. See all the photos and additional info after the jump. 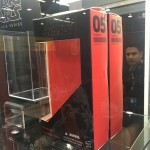 Here are the Star Wars Black Series 6″ and 3.75″ figures that were on display. These are from Hasbro’s “Twas The Night Before” event for New york Comic-Con 2014.